Blogging has seen me through some pretty amazing times and given me incredible opportunities. I have benefited hugely from the strong sense of community the Irish blogging scene has to offer. Through the privilege of writing about what I love, I have made some firm friends. After a particularly challenging March, I tweeted the notion of organising a meet up. Since sending out my initial tweet, there has been an overwhelmingly enthusiastic response. I am delighted to tell you all that I now have a list of fifty people! I am so happy that so many like minded people have embraced this opportunity to meet up and keep our community close and supportive. I am sad to say I can no longer add names to the list. With 6 days to go, I have had to have my final numbers confirmed. I can only offer the surprises planned to those I have down on my list. I hate the idea of turning people away so please don’t feel excluded. Please do call in for a sociable drink and to meet us all. First of June, I will be available to meet and help people find the Cafe from Noon. The Hard Rock is a personal favourite. It is also extremely central. I want this meet up to be relaxed, conversational and fun. Selected cocktails are five euro and food wise there’s plenty of choice and sharing options. If you are a young looking 18 or over and intend on availing of the cocktails please DO bring ID to avoid disappointment. If you are under 18, you are more than welcome to join us but you must stick to soft drinks. It is a fun way for people to stay updated about who’s attending and what’s happening ON the day. I have a treat or two in store for you, so be good and get tweeting! If you wish to contact me privately feel free to email, message or tweet me. Thanks again for organising. I know it can be a lot of hassle to organise events like these so it's great that you are. Awww I will be in France when this is on :-( So wont be able to go. I am yet to be able to make one of the events, always working!! Hope you have a blast! I would have LOVED to attend but unfortunately I'll be busy that day :/ Have a great time though and thanks for organising this :) Can't wait to read about it from all the Irish bloggers! No thanks needed, it is a pleasure! Thank you so much, hopefully in the future you can come along to another meet up! This is great! I am a new Irish Fashion/Beauty Blogger and was wondering what the Irish Bloggers scene was like and if there were any meet-ups etc. Thank you for organising. I would love to attend! This sounds great! Would love to come! Thank you for organising this! I'll do my very best to be there :) Can't wait to meet everyone! As mentioned several times myself, I wish I blogged, , but it's a tough living being a functional alcoholic office bint rugby whore like myself. I will of course be there. Maybe in a dress. Maybe. I wanna go there too!!! 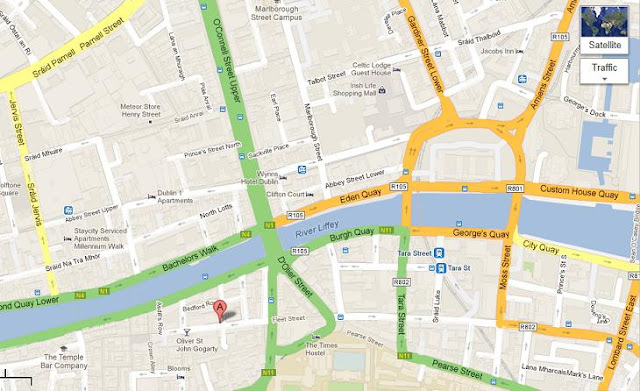 I have a few months living in dublin and would be delighted to meet you! I'll go with Rachel T. G. see u soon and thanks!!!!! c.o.c.o.